Since 1874, Haute Horlogerie according to Clerc Genève has been firmly geared towards innovation. Reflecting the visionary mind-set of Gérald Clerc who represents the 4th generation, the new Hydroscaph H140 Carbon Limited Edition Chronograph is no exception to the rule. It notably features an exclusive central-display chronograph movement and a high-tech case designed to be fully functional in deep waters and made of DLC-coated steel together with CCFC carbon – probably the material of horology 3.0. Issued in a 140-piece limited edition to mark the anniversary of the Geneva-based Maison, this exploring machine water-resistant to 500 metres is liable to quicken the pulse of all thrill-seekers. The story begins 140 years ago in Paris, where Clerc began producing fabulous individually crafted and assembled pocket watches issued in small series, thereby instating a tradition that has endured to this day. Ever since, the Clercs have faithfully perpetuated this spirit of excellence while keeping step with the sweeping changes that saw watches graduate from the pocket to the wrist. Until the 1970s, the Maison Clerc successively cooperated with some of the most renowned brands in the Swiss watch industry, such as Rolex, Vacheron Constantin and Jaeger-LeCoultre. Its creations found favour with artists including Salvador Dali, Paco Rabanne and Maurice Chevalier. Statesman General de Gaulle even ordered a one-of-a-kind model – a fascinating clock depicting the globe – which he presented as an official state gift to Nikita Khrushchev in the 1950s. During that same period, the Maison Clerc started producing its first diver’s watches, which were already authentic exploring machines equipped with hermetically sealed innovative cases providing an airlock for the movement thanks to thick glasses, impressively sturdy gaskets and robust screw-down case-backs. 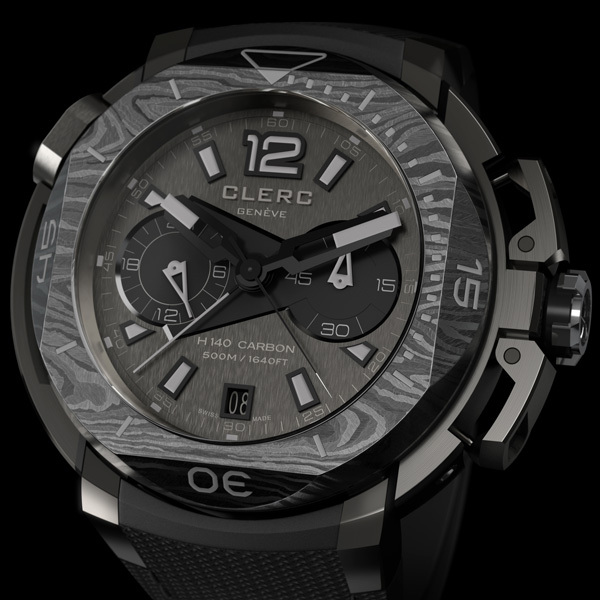 At a time when the vogue of underwater expeditions was in full swing, Clerc watches fully met the demands of professionals by remaining imperturbably water-resistant and operational despite the strong pressures to which they were subjected. With the release of Jacques-Yves Cousteau’s film The Silent World, the general public also soon discovered these hitherto little-known deep waters. Scuba diving gradually became more accessible and its popularity has steadily increased ever since. Gérald Clerc also caught the ‘virus’ and regards the conquest of the depths as the most formidable human adventure of all time. The first watch collection created by Gérald Clerc in 1998 was to give rise to the successful collection that delights fans around the world. 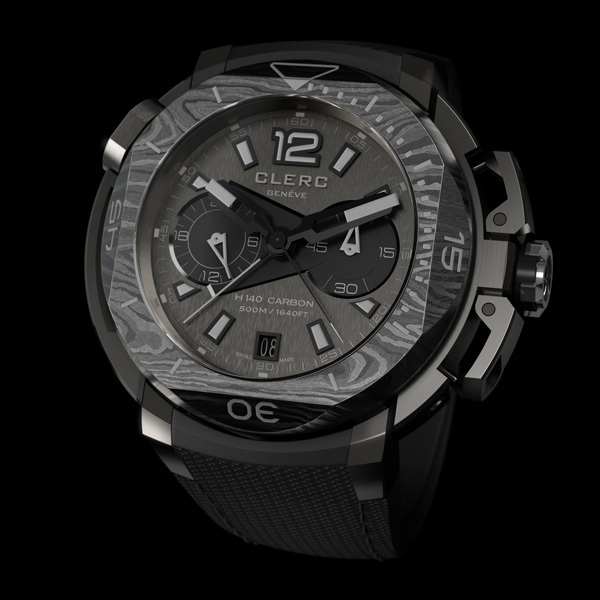 Innovation-driven While he is heir to a 140-year legacy dedicated to Haute Horlogerie, Gérald Clerc is first and foremost resolutely future-oriented. He has never been interested in re-editing the past, but instead sees history as a foundation on which to build tomorrow’s watchmaking. In tune with his determination to stay one challenge ahead of the rest, he thus imagined the new Hydroscaph H140 Carbon Limited Edition Chronograph. Its technical and powerful case is not only made of DLC-coated steel – a tough and scratch-resistant treatment – but also features CCFC, a new high-tech material. Entirely developed and produced in Switzerland, this ultra-light carbon composite was initially intended for making racing-boat sails. It made a noteworthy stage-entrance in the America’s Cup, the legendary competition that was won twice in a row by Switzerland’s Team Alinghi. The properties of CCFC carbon – which is notably twice as resistant to microfissures than any other composite material – account for its current use in other cutting-edge fields such as aeronautics, the aerospace industry and Formula 1 motor racing. Composed of multiple ultra-thin carbon fibre layers with a maximum thickness 30 microns, CCFC is impregnated with resin before being woven in such a way as to modify the direction of the weft by 45° between each layer. After subsequent heating, the material lends itself to machining better than any other composite, paving the way for all kinds of possibilities in the manufacture of high-precision components. Carbon CCFC is a material ideally suited to state-of-the-art technologies and not only offers peerless rigidity, but is also particularly attractive, since the weaving operations create mottled effects that are different in each case and thus give each model its distinctive character. The Clerc Hydroscaph H140 Carbon Limited Edition Chronograph is unique in all respects, starting with its exceptional 103-part case that is the most complex on the market. Developed on the basis of an uncompromisingly function-driven approach, it is flanked with lateral reinforcements and a construction ensuring water resistance to 500 metres. The rotating bezel with its emblematic octagonal lines is protected from any involuntary activation by an exclusive device: a built-in retractable flap on the case middle must first be deployed before pivoting the bezel via a dedicated crown at 10 o’clock; and once the flap is returned to its initial position, the bezel is once again secured against any risk of accidental deregulation. The 3 o’clock time-setting and winding crown ensures an optimal grip. The broad and partially cut-out chronograph pushers react to pressure by pivoting around a lateral axis acting as a lever, thus ensuring uniquely smooth handling and excellent precision for short-time measurements. Comfort is also a strong point, since the mobile lugs ensure perfect adjustment on the wrist, even when worn over a neoprene diving suit. The sapphire crystal case-back of this limited-edition watch commemorating the 140th anniversary of the Maison Clerc a plunging view of another feat: the exclusive C608 calibre beating at the heart of the Hydroscaph H140 Carbon Limited Edition Chronograph. This authentic Haute Horlogerie ‘engine’ beats at the high frequency of 4 Hz (28,800 vibrations/hour) and orchestrates an unusual short-time read-off mode via a central display. Rather than indicating the minutes on a counter, the chronograph is equipped with two hands ensuring perfect and intuitive legibility: a central chronograph seconds hand as well as an additional hand counting off the minutes. The finely tuned mechanism of the self-winding C608 movement also powers a 24-hour day/night indication that is especially useful when adjusting the date. The indications stand out with surgical precision against an elegant dark grey dial. 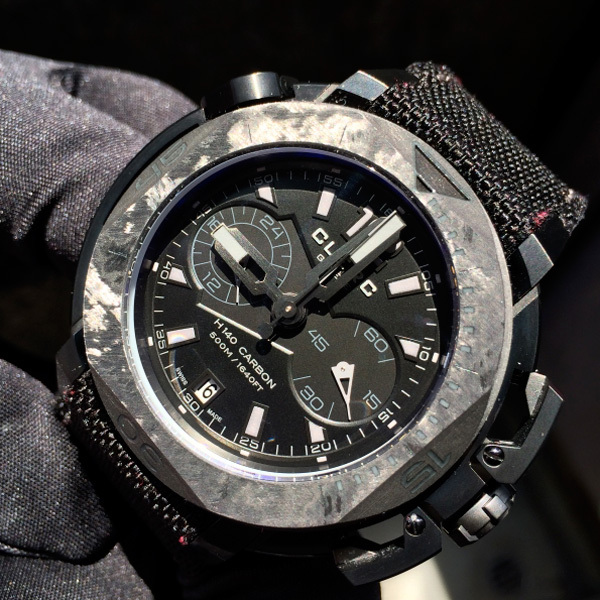 Whether on land or far below the oceans, this chronograph can be read off with impeccable clarity thanks to a superb cool grey Superluminova coating on the hands and hour-markers. A new water-resistant carbon fibre-textured strap sets the ultimate touch of refinement to the Clerc Hydroscaph H140 Carbon Limited Edition Chronograph – a strong new reference in the line of powerful and prestigious diver’s watches bearing the Clerc signature.